Not everyone who reads this blog has been fortunate (ahem) to have started from the beginning, so as the kitchen is unfolding, I wanted to pull out some photos from the archives to show you how things got started. 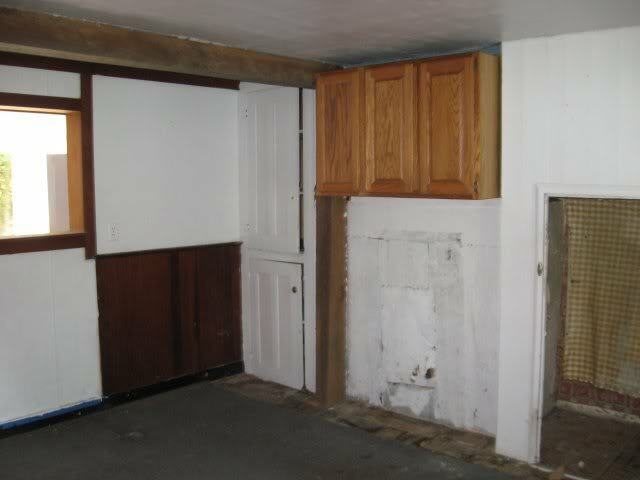 This is what the kitchen looked like when we bought the house. It was divided into two rooms. The log wall along the left side (which is now home to the sink) can give you a sense of the layout compared to what it looks like now. 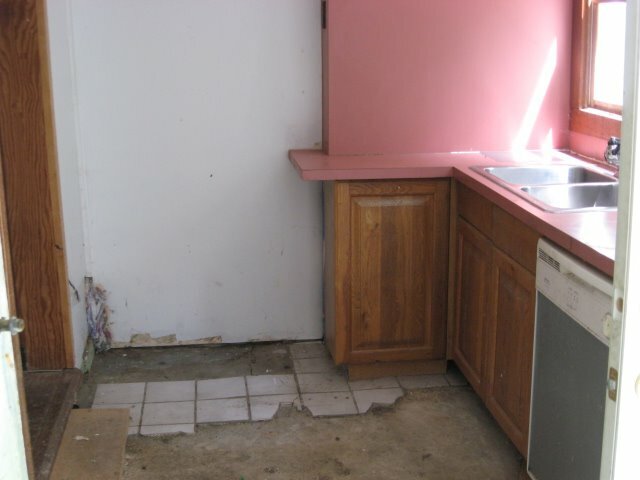 The second photo shows the former entrance-slash-kitchen sink area. Yep, this was the first impression you got when entering the house. And in this final photo, you can see how the fireplace used to be covered with plaster. (It's hiding behind that area with the 3 cabinets going across the top.) We had to have it rebuilt as the bricks were dried out and crumbling. I can't believe people lived here. And I don't know what possessed us to buy this place... I guess it was a combination of the exposed log walls and the ridiculously low foreclosure price. After a total gut (down to the dirt beneath the floorboards) and a long three years, we're not done yet but we've come a long, long way. I love seeing before pictures. You guys have come a long way! And even though at times you may have said "what on earth were we thinking??" - when little Johnnie is running up and down those new stairs or making cookies with you in the kitchen, it will all be worth it to have such a fantastic place to raise your family! Holy cow! I can't believe this is what you turned into the photos you included in your last post. I'm seriously floored. Kudos to you for seeing the potential!! Thanks! It helps to look back and see how far we've come, for sure.